Wow, it’s been a crazy, sad week with moments of inspiration from heroes shining through the fog. It seems a good time to slow down and reflect on life’s blessings. Tea is a slow drink, it must brew on its own schedule. It can’t be rushed. 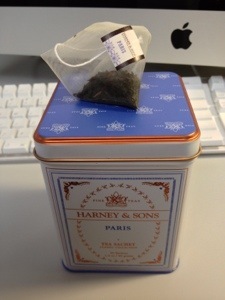 This tea, Paris by Harney & Sons is delightful. I take it with a bit of sugar and milk. It’s just perfect for a Friday afternoon. So true Claudia! I just picked some chocolate mint from my herb garden to brew with my tea. It’s great for my mint to bush out and delish in tea. Way to keep us on our toes–no candy in this post! But it was still sweet 🙂 Good point about tea brewing on its own schedule.